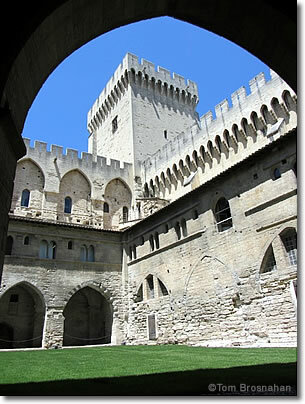 Among the larger cities in Provence, Avignon is also among the most interesting, with its Palais des Papes, the palatial residence of the Roman Catholic popes from 1309 to 1378, and schismatic popes until 1417, and its Cathédrale Notre-Dame des Doms. Located 100 km (62 miles) northwest of Marseille and 700 km (435 miles) south of Paris (map), Avignon makes a good base for visiting northern Provence. Its truncated Pont St-Bénézet bridge made famous by a folk song ("Sur le pont d'Avignon on y danse tout en rond...") still juts into the Rhône River, its medieval ramparts still surround it, and nearly a dozen good museums preserve its rich culture and history. You may want to dance during the annual Festival d'Avignon, three weeks in July when performances of music, dance and drama, art exhibits and other cultural manifestations fill the city, day and night. Still, after your visit, you may remember best sitting at a café-bar or restaurant in one of Avignon's medieval places—perhaps the spacious central Place de l'Horloge in front of the Hôtel de Ville with its 14th-15th-century clock tower.